In STEEPS categorization, this is a Scientific, Technological and Political counterfactual. In 50 CE, could Hero of Alexandria have invented the first practical steam engine for water pumping and transport, sixteen hundred years before impulse steam turbines were invented by Giovanni Branca (1629) and John Wilkins (1648)? It certainly seems so. Hero was a prolific author (with seven known books) and an illustrious engineer. We think he invented the first vending machine, the first syringe, the first wind-powered machines, and many other mechanical contraptions. 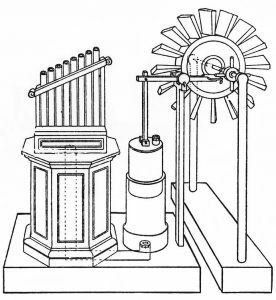 Most famously, he built a primitive rotary (reaction) steam engine, the Aeolipile, and published diagrams on it (right) in his work Pneumatica. He even used this device to open temple doors. 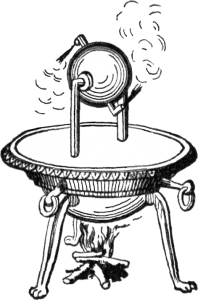 Hero may not even have been the first inventor of this device, as an aeolipile was mentioned (though whether it had a rotating engine was not described) by the Roman engineer Vitruvius in the 1st century BCE in his incredible book on ancient engineering, De architectura. Hero also improved the efficiency of the hand water pump, which was originally invented by the Greek engineer Ctesibius circa 200 BCE. The Romans even used Hero’s pump and a mechanical fire hose, to put out fires. Look at this amazing example (left) of Ctesibius’s/Hero’s pump, the sipho, described in ancient texts by Pliny and Vitruvius, found in perfect condition after two thousand years underground. It was used by Roman Vigiles, or firefighters, to put out fires, from a cistern pulled by horses, and filled by hand bucket brigades (right). It is easy to argue that Hero’s version of the water pump, combined with a more efficient steam engine, could have led him to the steam engine’s first great application, steam-driven water pumping, an advance so valuable we think it would have found its way into broad use in Roman cities, regardless of social opposition. A significant benefit for any such technology would likely have been needed, because by the time of Empire, the Romans were mistrustful of technology. They only allowed it to proceed when it obviously served their goals. In 2015, Theodosis Tassios published that Hero must have connected his Aolipile to his pump, creating the world’s first (impractical) steam-driven water pump. He was always looking for ways to make practical technology. Amazingly, all Hero would have needed to do, to make his aolipile practical, would have been to turn its rotating ball into a small windmill rotating on an axle inside a single output jet from his boiler. Alternatively, and less powerfully, even a system of multiple steam jets hitting cup-shaped windmill blades inside the power chamber might have been sufficiently efficient (picture right). Either approach would have created the world’s first impulse turbine, and a practical rotary steam-driven water pump. A better way to pump water up into cisterns would have greatly improved Roman water works and aqueducts, which were highly valued by Roman nobility, and provided better irrigation for their fields, more Roman plumbing, baths, toilets, and sewer systems. Another obvious benefits of this pump, for any family that had one, would not just have been cisterns of water on the roof, providing pressurized water, but cisterns of hot water on the roof, for the baths of Roman nobility. The still-hot effluent from the boiler could have been collected in a separate cistern, and periodically pumped up by same water pump into insulated hot water cisterns on the roofs of Roman villas, and in the massive Roman public baths, which were heated by both wood and coal. Both the Greeks and the Romans used cork, asbestos, cavity walls, air gaps, and even special bricks for insulation. So insulated hot water cisterns for pump effluent is an obvious way to improve the value of the pump. With benefits like these it’s very easy to argue that steam-powered water pumps would have spread rapidly throughout both the Republic and Empire. Do you think Hero could not have made the mental leap to from a spinning aeoliphile to a steam turbine? I would argue he was just one dream away from it. Recall that Hero built the first wind-powered machines. Look at this one (right), which he used to run the first wind-powered organ. In this particular artist’s conception, those blades look just like today’s steam turbine blades! I’d love to see the Mythbusters gang, or a curious craftsperson, build an impulse turbine version of the aeolipile, using a scaled down version of the blades from Hero’s wooden windmill. Hero would likely have built his first turbine blades out of bronze, or even wood in a prototype, but he would have soon moved to iron, then the toughest substance then known. He would likely have placed his boiler over a Roman blacksmith’s hearth, the hottest fires in Alexandria at the time. I bet that engine, hooked to his pump, would have pumped water like crazy, and been vastly superior to hand-chain water pumps used at the time. Anyone want to build one? Hero’s steam-driven water pump, with adequate wood, collected by slaves, would have created great water pressure for whole neighborhoods in Roman cities. Such pumps would be much more efficient at filling high cisterns than the hand-operated chain pumps being used at the time. High water cisterns, as all Roman engineers knew, are a massive energy storage device. The flow of water from high to low cisterns, in plumbing, can be used not just for irrigation, baths, and sewers, but to run all kinds of small engines, to saw wood, to grind bread, and many other things. In addition to Pneumatica, Hero would have written a followup book, Hydraulica, on the flow of water to do even more useful things, as water is a noncompressible fluid of far higher density than air. Hero’s hydraulic engines could have run at first with water wheels, which were prevalent at the time, but his team would soon learn to use their newly invented spinning turbine blades, operating inside water pipes rather than inside steam boiler nozzles. Having a way to get across their Empire faster would also have been of huge interest to Roman leaders. Thus it’s easy to imagine that steam powered propellers (turbines) for Roman warships would have been an another early experiment with these engines by nobility-backed engineers. The first military steamships might even have emerged ahead of the water pump, since improving the speed of Roman triremes was of great military interest. Seeing a way to much better aqueducts and plumbing would be nice, but having faster ships would have been vital to both the Republic and Empire. Roman triremes had 170 rowers, and were generally very light, but many had massive front ends for ramming other ships. Most were optimized to run at six knots for very long distances across the Mediterranean. Steam turbines for ships were eventually invented by Charles Parsons for the British navy, in 1884. The top speed of Parson’s first steam-powered ship was 34 knots. I’d also love to see someone put Hero’s nearly-discovered impulse steam turbine engine on trireme, adding an external “windmill propeller” to the axle, another plausible early mental leap, to see if it would reliably run faster than six knots. I bet a version could easily be built that would run twice as fast, for very long distances. Anyone want to build one? Tassios has also published arguments that Greek engineers could have invented the steam engine circa 200-100 BCE. That may be true, but with our current knowledge of history, Hero gets our vote as the most likely engineer to make a practical steam engine in ancient times, as we can see how close he was to harnessing this great natural energy source. He was close enough for us to cry a little that it was missed. Historians sometimes argue that labor-saving machines weren’t generally needed in a time of slaves, and that most of the early Greeks and Roman philosophers had a bias against them. The first point has some truth but is an overstatement, and the latter point is true but irrelevant. History shows that both Greek and Roman cultures used lots of intricate labor and brain-saving machines when they served their purposes, and there were scores of Greek and Roman engineers like Ctebius and Hero who built such machines. It is true that engineers tended to be miserably poor, because their skills weren’t sufficiently appreciated by nobility. But they invented prolifically. 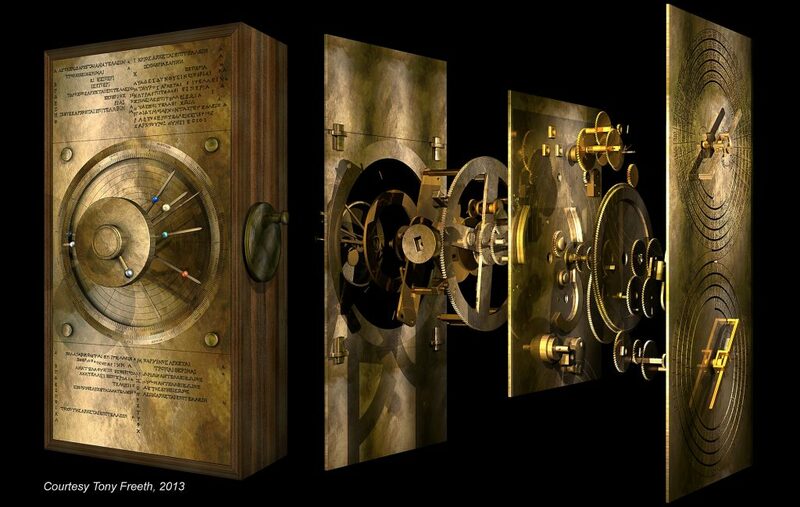 For perhaps the most famous example, see the Antikythera mechanism, an orrery and analogue computer built by the Greeks circa 90 BCE, to get an appreciation of the extent of Greek mechanical ingenuity. The intricacy and intelligence built into this device takes your breath away. Recent scholars think it was built in Greece circa 205 BCE, not 100 BCE as originally estimated. As we’ve argued, Roman slaves would have been used to collect vast amounts of wood to run Hero’s steam engines. Once Romans were collecting large amounts of wood, steam powered sawmills would have been another obvious next step. See this video of a DeLoach Steam Powered Sawmill from the 1890s. It’s easy to imagine Hero or his team building a primitive version. In addition to speed at sea, the Romans would have wanted to use steam to go faster by land. That too would likely have come soon after the first working steam engine. Let’s see why. It’s hard for us today to appreciate the immense scale of Rome’s land-based engineering feats. According to History.com, over 700 years, the Romans built over 55,000 miles of paved highways throughout Europe. That’s enough road to encircle the entire Earth, twice! That is a truly incredible feat, and an awesome focus and scale of engineering, when you think about it. The Appian Way, for the most popular example, was a beautiful flat road which ran for 350 miles across Italy. 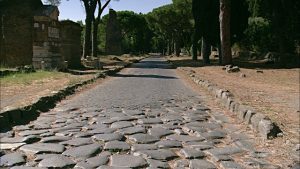 Roman roads could be made smooth or rough depending on the size of their paving stones and the care taken in construction. See picture of a small section of the Way, with two paving stone sizes, at right. Most obviously, the Romans could have built a steam-powered railroad, as even railroads, surprisingly, were also in common use at the time. Putting a heavy steam boiler on tracks and getting it to turn wheels fitted to a low-friction track is an obvious application, once you’ve got a good engine. The ingenious Greeks had already built a human-powered railroad, the Diolkos, which ran for 8 km over the Isthmus of Corinth on the Pelepponesian peninsula, for at least seven hundred years, from 600 BCE to 100 CE. Archeologists tell us the Diolkos ferried boats across the isthmus, over an 8 kilometer track rising 75 meters above sea level at the top. This image (left) shows a very large ship being pulled on the Diolkos by slaves. In reality, most ferried ships were probably much smaller, the personal ships of nobility being taken over the hill to save sailing time. The Romans took over the running of this railway when they made Greece into a province in 146 BCE, and soon after they had at least one known railway operating at the Tres Minas gold mine in Portugal, and probably many more we don’t know about, for moving stone and other heavy objects on tracks. To run their engines quickly, Roman slaves would also have created a lot of charcoal from wood. Romans used both wood and charcoal for heating, but charcoal burns at up to five times higher temperature than wood, so it is the fastest fuel for steam engines. As it is labor-intensive, it makes sense to make it only when you really need high temperatures, as for blacksmithing, and running steam engines at high speed. Soon they would even have been mining vast amounts of coal, which burns nearly as hot as charcoal but is far easier to mine. Amazingly, the Romans were mining coal and using it to smelt iron in both the Rhineland and Roman Britain by the late 2nd century BCE. The Chinese were also using coal for heating as early as 1,000 BCE. 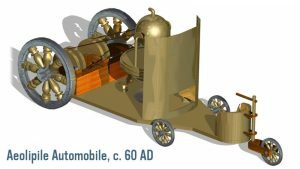 The Romans might even have built a steam powered chariot. Take a look at Jason Torchinsky’s sepeculative model of an aeolipile-driven chariot (right). If Hero had created an impulse turbine aeolipile, a variation of this, without the middle support wheels, and with the front wheel relocated directly under the steering rudder, might actually have been fast at traveling Roman roads. The most important roads would have been made particularly flat, and perhaps eventually even asphalted as well. Thus Roman Railroads and Roman Automobiles are an alternative history that very nearly happened. Someone should write this as fictional story and movie. Perhaps this story already exists? Let us know if so! The impacts of an Industrial Age Rome certainly would not have all been positive. Just like the European Industrial Age, we would have seen massive worker exploitation, deforestation, pollution, mechanized warfare, and many other negative consequences. The Roman Empire itself might have lasted a bit longer as well, though it fell largely because of social and political, not technical reasons. But I think it is easy to argue that a Western Dark Ages, after the fall of Rome, if any, would have been vastly shorter, and as a species, we would have have learned our way out of our industrial age excesses much earlier, moving into today’s information age centuries earlier than we actually did. Foresight matters!